EDS entered in to a partnership with Team Cally, based on the Bemerton Housing Estate in London, to deliver a pre-employment training course on behalf of the London Development Agency. The training course was targeted at those individuals (18+) not in employment education and training (NEETS). The six week course offered pre-employment skills training to 15 unemployed individuals, linked to potential job opportunities on the nearby Kings Cross development site and other established employers across London. It was complementary to the services offered by Connexions, Jobcentre Plus and other such agencies. The training covered such skills as health and safety; customer care; literacy & numeracy; first aid; fire safety and manual handling and, on completion of the course, successful trainees were awarded accredited qualifications and certificates of achievement, which in turn assisted in ensuring a seamless transition into employment. 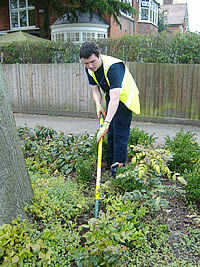 In 2010 Westminster City Council commissioned EDS to manage the delivery of the second phase of the DWP funded Future Jobs Fund programme within Westminster. Through this contract EDS recruited and employed 39 long term unemployed Westminster residents on employment contracts linked to private sector and voluntary sector employers across Central London. A wide variety of posts have been created including: Grounds Maintenance Operatives in the Royal Parks and Islington; School Escorts in Westminster; an Economic Development Assistant with Westminster City Council; an HR Assistant with Eaves Housing for Women; a Community Worker linked to the Kings Cross regeneration programme; a London Transport Museum Assistant; an English National Opera Assistant; and Retail Assistants for Circle Sports - a fledgling social enterprise business. To date, 24 of the 39 individuals who participated in the programme have gone on to secure permanent employment. In August 2009 EDS was appointed by DWP as a National Contractor delivering the Future Jobs Programme in London and the West Midlands. EDS’s programme was focused on providing six months of on-the-job training and practical experience for 18-24 year old long term unemployed people linked to a variety of private sector partners. EDS employed 61 people on the main scheme and an additional 17 posts linked to LB Islington’s FJF Programme in a variety of posts ranging from: Highways Maintenance Operative; Recycling Officer; Grounds Maintenance Operative; Administrative Assistant; and Waste Management Assistant. The programme was held up as an example of good practice by DWP for its high retention rate and positive outcomes, with 56% of those employed obtaining permanent employment in partner companies and over half of the remaining employees electing to enter full-time education/training. Client: LB Islington Council, London Development Agency, and Enterprise Islington. Over a two year period EDS developed a range of Transitional Employment Projects targeted at ex-offenders and long-term unemployed Islington Residents, linked to the Waste and Ground Maintenance contracts delivered by Enterprise Islington. The first phase of this project utilised Emirates Stadium Section 106 funding to provide intensive Grounds Maintenance training for 16 long term unemployed residents of the EC1 New Deal for Communities Area. All 13 of the trainees who completed the training were offered seasonal employment on LB Islington and Housing for Islington Grounds Maintenance contracts. Eight of these trainees have subsequently been appointed to permanent posts. The second phase focused upon the provision of a 26 week structured programme of mentoring and training and employment for 10 residents (5 ex-offenders and 5 long term unemployed) with a worklessness background. All 10 received on-the-job training in Waste Management and Grounds maintenance as well as formal NVQ training to Waste Management Industry Training and Advisory Board (WAMITAB) standards. At the end of the 6 month period 2 were offered permanent posts and 4 went into full time education/training. EDS has developed a range of Transitional Employment Projects targeted at ex-offenders and long-term unemployed individuals. These projects, of 26 week duration, offer full-time employment opportunities within a private sector organisation, during which period, individuals are provided with a structured programme of mentoring and training appropriate to their respective roles. If successful at the end of the 26 weeks they are offered permanent positions within the organisation. The overall aim of these Transitional Employment Projects is to offer assistance with offender rehabilitation, with particular emphasis on the development and implementation of clear pathways into employment for offenders nearing the end of their sentence and maximise employment opportunities for long term unemployed individuals. In Haringey all 12 trainees received NVQ qualifications; 3 obtained permanent employment and 7 went into full-time education/training. In Manchester half of the 20 trainees were offered permanent employment on completion of the 26 week scheme.